It was great to get up and away early today – we had timed the walk to get in at 4:10, leaving at 7:00am; leaving at 6am we got in about 12:30pm – which means I allowed much more for the sand hills than what was needed. It was fantastic to be under so little pressure for the town stuff. Had a delightful walk past fabulous crazy granite boulders close to camp, one like shark's fin, another like a charging bull. Really great and the meadows of flowers continue. Saw a kangaroo a few metres away, quite unconcerned as we headed along a ridge with great views of bays. Headed into forest with granite formations at end then across a wide open plain seemed a bit boggy. Saw a yellow and red kangaroo paw not seen before. 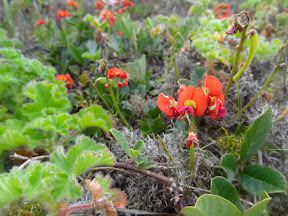 Some swamp with two varieties Agonis, then off into sand hills to beach. Beach supplied a toilet of which both of us were glad to use. Then up into sand hills again and gradually in came the rain. Had to poncho up, and it wasn't as wind driven as a couple of days ago, but quite chilly enough. We left camp with high hopes of a dry day, even if it was under leaden skies – they seem a lot lighter than yesterday. We walked well through the pre-dawn and the lovely scenery and amazing rocks until Light's Beach, where we both had a toilet break. The drizzle started as we climbed the sand hills away from the beach and steadily increased to rain, forcing us to put our ponchos on. 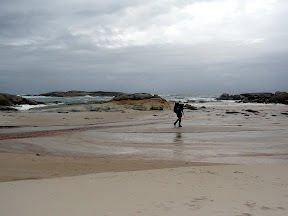 Walking was not overly pleasant, as the wind also had come up, and blew the rain in at a severe angle. I had in fact left my hat in the toilet, and Sandi wanted to run down and retrieve it for me. The increasing drizzle forcing the camera into its water-proof clip-lock bag. 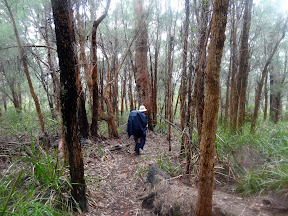 We marched doggedly on and really started to enjoy the walk in the rain once we'd entered the forest: first, dwarfed Jarrah, then tall Jarrah and finally Karri. Headed on at a fair pace, really does give wings to the feet! 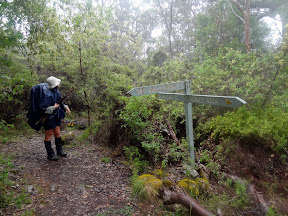 A couple of stiles and a brief private property then into forest again and up to Monkey Rock and rain eased virtually ceased allowing us to head out onto the rock for morning tea and views. 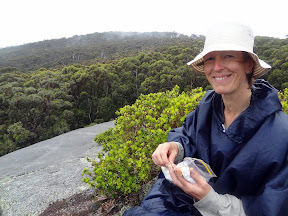 The rain paused long enough for us to have morning tea on Monkey Rock, with amazing views, then started drizzling again as we were ready to continue. Did chill off quite quickly, so was pleased to head again. Quite surprised to round a corner and there are the boys who must've really motored when the rain hit, then overtaken us whilst we were on the rock. Didn't stop and kept up Mt Hallowell with all its fantastic granite. Enjoyed a path so much more familiar in style to our usual walks at home, really lovely. 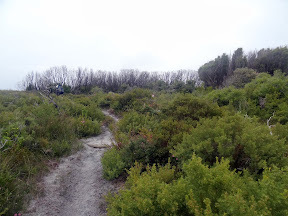 Quite misty, so didn't head out spur trail to summit. Some quite extraordinary granite en route down. Some granite a spot slippery, so took our time. The granite boulders and Karri on Mt Hallowell was just awesome – huge, shapely and dripping. 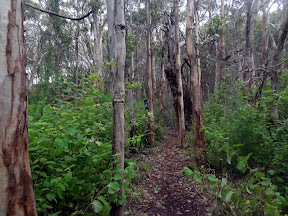 Once out of the forest, we hit civilisation, but route kept diving us in and out of bush, some quite wet areas. So thankful for no further rain from Monkey Rock. Wonderful. Some very up-market houses along the way near inlet. Seemed to take ages that last bit, but finally arrived somewhat differently than we expected. The last 7 kms through the built up area of Denmark seemed to go on forever – but even in the midst there were lovely flowers and views. 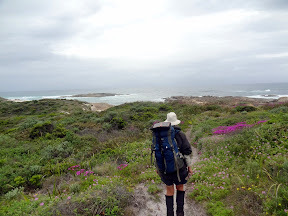 Started a drizzle again for the last few kilometres – just to remind us what real bush-walking is like. 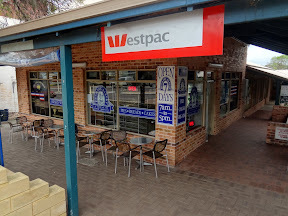 After logging off on our day's walk, we headed down the road to the very close Caravan Park to collect our food parcel, sort things then head to town to get our provisions. 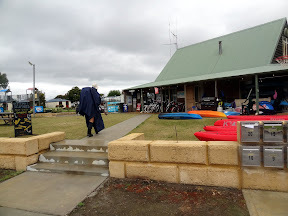 The caravan park is wonderful and supplied many cups of tea and battery charging – we've no idea what the weather is doing, but the clouds, if not rain, seems set in for some time. Another successful food drop. Only thing missing was laundry powder – from memory: the box we bought wouldn't do all caravan parks and we left this one out because it was only 3 nights from the last and 4 to the next. Caravan park had a single serve though. 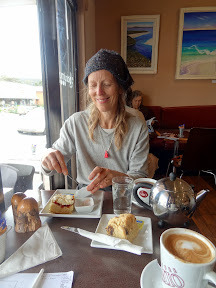 We had our lunch with many cups of tea (a wonderful occurrence because we'd left so early this morning), put the washing on then headed to town along the path next to the river. Glad of tea and lunch at camp ground and opportunity to change from wet clothes and boots. Ended up leaving washing soaking while we went to town. Great walk day and packless. Able to leave stuff in camp kitchen with no problems. 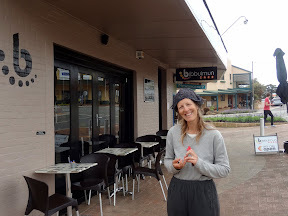 Went to Bibbulmun Track Cafe, which had an interesting range of whole food type of cakes, etc. I ordered tea and scones (1 date with butter & 1 plain with jam & cream) and all was a bit disappointing. P got a caramel, beetroot and seed loaf and coffee; both were pretty good, especially seedy/caramel topping. Headed to IGA (a big one), bought diced steak, mushrooms and onion to BBQ plus shanghai stir fry vegetables (beans, capsicums, snap peas, brocoli and water chestnuts) plus potatoes with sour cream with garlic and parsley. Also fruit cake, custard & ice-cream (vanilla bean & elderflower). Got apples and oranges and crumpets, butter & honey (should be nice for a change and dinner was very nice courtesy of P cooking it). New soap is olive oil type. Got exercise book and newspaper to stuff boots plus a postcard for Aaron and Claire. Headed back out of town [via Denmark Bakery from which we bought pies for our 'special' lunch tomorrow], spitting a bit, so not wanting to get wet and we didn't: it eased off again though but come down again once we were back. 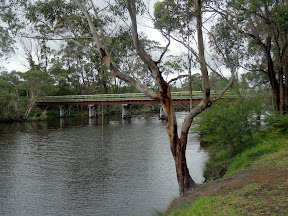 We walked along the road back to the Caravan Park, and passed a beautiful flooded area of Melaleuca, also crossed the footbridge before heading back to see about our chores and ablutions (much looked forward to). Do feel tired and a spot achy. The deep heat has helped the buttocks these past couple of nights. Glad to have the clothes and my hat all washed up. P's shorts seem stained, maybe colour from pack? Anyway: they do look cleaner! Good shower. So after a sumptuous meal cooked on the BBQ (with microwaved frozen vegetables), we set up the tent for a quick get-away in the morning (we'd arrange Mad Fish Charters for 7am, as he had a busy schedule after dropping us on the other side of the inlet) and Sandi headed for bed: I was still charging our batteries (including the FUSE battery) via the wall socket (the solar charging available has been pretty low and it's wonderful to make use of grid power to get us going again). Ended up leaving the camera charging its batteries and headed to bed myself; the newspaper stuffed boots hopefully drying with under the counter. Showers with lots of hot water and good flow. Kitchen with microwave, toaster, kettle, stove top, fridge and freeze and BBQ. No utensils. Great dining area, protected enough (wasn't too windy while we were there), lots of great, flat grass (some had been under water because of recent storm). My right foot had sharp pain – outside of ball today. Not constant, but significant. This is the day after the long beach walk, barefoot, a lot of which was on hard sand (I found too hard and had to be careful). Also, after our sandal day, I had same pain. 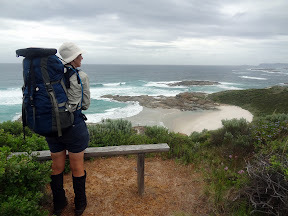 After Donnelly River Village, I started lengthening my stride to roll my feet over better. I think this has definitely helped the pain in the ball of my left foot, as it has not been anywhere near as painful. Also, I wonder about the sand walking being softer has helped? When I take shorter steps, I tend to plod and put my foot down flat; when the stride is lengthened, I land on my heal. Hard to do when tired or going up / down hills (steep). The left foot must have neurological damage because my 4th toe is numb underneath.